I use a ACV/water solution as hair conditioner. The science behind it is fuzzy right now (sick+pregnant+kids=lamebrain), but it has something to do with ph levels; meaning ACV + ph levels = WIN. I love it on my hair. 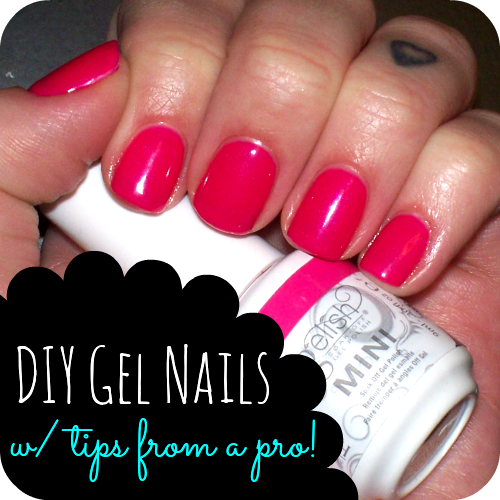 It closes the cuticles on each hair strand leaving it insanely smooth. And yes, stinky while applying but NO SMELL once rinsed. I rinse for a minute, maybe?.. Now I'll be trying it as a toner. You could also try a baking soda scrub once a week to gently exfoliate your face (add water to baking soda to make a runny paste and massage over your face avoiding the eye area. rinse with arm water. Done. ), but I wouldn't do the ACV toner immediately after. Stingy ouchies. Omg I've heard of this too! One of my clients I can't remember who, was doing this too! I even tried to smell her skin and it caught her off guard. I wish I could remember who it was lol! I jut made a bottle of this and put it in my skin. Burned for just one second feels great now. I could drink this stuff. Vinegar yum! A lot of people drink it daily! It's supposed to do a ton of great stuff for your body when taken internally. I've never tasted it but the thought of it grosses me out, though I do know some people who say they like it. I saw that they have these gelcap supplements of them...maybe I'll look for some of those at the store tomorrow! That might be easier than drinking the stuff. Did the ACV work for the person you heard about it from? In the winter I drink it hot with organic apple juice and some cinnamon. In the summer it's pineapple juice and lime. First thing in the morning! I definitely have to try this! Thank you so much for sharing it! I have a simple Face Wash & Face Lotion recipe that you can make from ingredients you probably already have at your house. The only thing missing for me was the toner. I'm glad that I found you & this tip. Thanks so much! I will have to try that~ Thanks for the research and sharing... I am your newest follower from COM hop. Love for you to follow back. Hosting a Mom's Mingle. You are welcome to link up. wow this is great.. I'll definately be passing this on to my daughter , who I am sure will share with her friends.. thanks for this super cheap miracle in a bottle. I am so happy for you that your skin has cleared and thus you can enjoy life without that concern.. Yes! My children will no doubt get my problem skin, so I will be keeping this stocked for the next 20 something years I'm sure! I hope it works for you guys. Keep me updated! Awesome!!! I am going to try this. I am thirty years old and have had such a terrible time with breakouts as of late. Going through my teens never a pimple... now I am thirty something year old mom and I am breaking out like a kid. So annoying. Hopefully this helps. I hope it works just as well for you! I totally feel you there...28 & still had pimples until about 2 weeks ago! It's amazing how something so seemingly small can have such an effect on you. I feel so much better already. Good luck & let me know how it works! You're better off to use organic cider vinegar. especially if consuming it. it's actually different, in that it is still active and producing a mother. it's much better. I'm going to try some higher grade, organic ACV next time & see how the results compare! This is awesome! I drink a mixture of hot water, ACV, and honey when I have a cold and it always makes me feel better. I've never heard of putting it on your face. Can't wait to try this! I haven't tried drinking it yet because I'm afraid of the taste. Let me know how it works on your skin! I followed back! Let me know how this works for you! This is awesome! I'm heading into the kitchen to try it now! LOL. With my not so fancy tap water and cheap ACV!!! I'm a new follower and would love a follow back! OK! So I've been using this for about 2 weeks now, and I see quite an improvement in my skin! I think I need to up the amount of ACV, as I am still breastfeeding, and therefore quite hormonal. While my skin in not yet totally clear, I've seen a HUGE reduction in breakouts, far less blackheads, and my skin is sooo soft! I'll keep up with this treatment, for sure! I also take about a tablespoon, straight, after I eat anything other than raw fruit or veg. It helps aid in digestion, helps boost metabolism, and also will help regulate your internal ph. If you've ever dealt with UTI's (or, ahem, issues in the lady parts), this stuff is a Godsend. Thanks again for the skin-clearing tips! Next I'll try your mask! Sounds like we have the exact same skin type. I am absolutely starting this tonight!! Hooray! PLEASE let me know how it works for you! I'm interested in knowing and I love hearing when people find that it works! I am SO glad I found this on Pinterest! I am 34, and have had breakouts since I was 12. Not horrible, but always at least 4-6 zits at a time. My skin is very oily, and I have tried everything just like you! I have had my dermatologist on speed dial for the cystic pimples that need injections. I didn't have health insurance (now I do), so I was paying $70 for injections for each visit. I've been so desperate to have them go away, I'd pay anything, though. I just mixed up my first bottle. I'm at wits-end with my skin! I can't wait to try this!!!! Thanks for the detailed post about it, my skin sounds alot like yours and your post has given me the courage to try this out! OK. 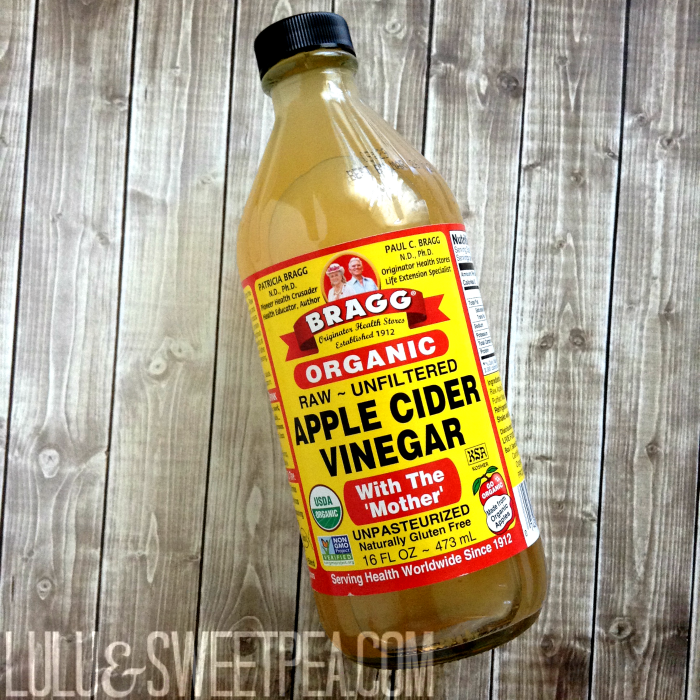 Here's my review of this remedy -- The negative part: I've been using ACV for over a week now. While it has helped with my skin slightly, I still have had breakouts. :( Not terribly huge cystic ones, but still annoying zits that come popping up (no pun intended). Maybe it's just my horrible hormones? The positive part: my skin is smoother, and when I do get breakouts, I've noticed they don't last as long as before. 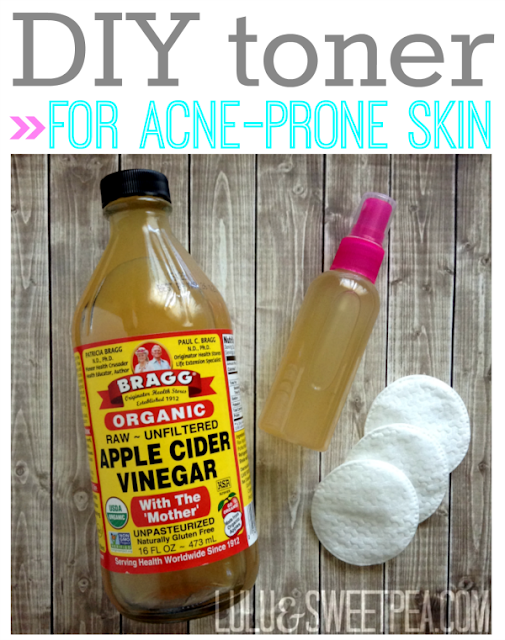 Overall, I'm still using ACV as a toner since it's all natural and much cheaper than other products. I just wish I could come up with a fool proof formula that would stop me from breaking out ever again. nb. ive been using neat vinegar as i first read this post 3 weeks ago and forgot about the diluting bit! it stings a tiny bit for the first few seconds but thats it. also my husband has not noticed the smell, but then he hasnt even noticed the bottle of vinegar on my dressing table either so...! now im going to consider what moisturiser to use, ive never used any as i feel it exacerbates the spots and my skin is already greasy but i will have to look into what there is. do you put it on straight after the vinegar? Can't wait to try this and was wondering what face wash do you use before you apply the ACV? so i have tried it out only twice now (last night and this morning) i can already see a difference! only thing is that.. the smell is suuuper offensive! i don't wear any face make up or use serums or anything like that. i only use MAC face moisturizer and that doesn't help any to mask the smell. do you think my results will hurt if i leave it on for a little (till my face dries) and then wash it off? Could I use Distilled White vinegar instead of Apple vinegar? I am totally going to try this!!!! But for the moisturizer after, can it be a scrub? or should I stick with a moisturizer? 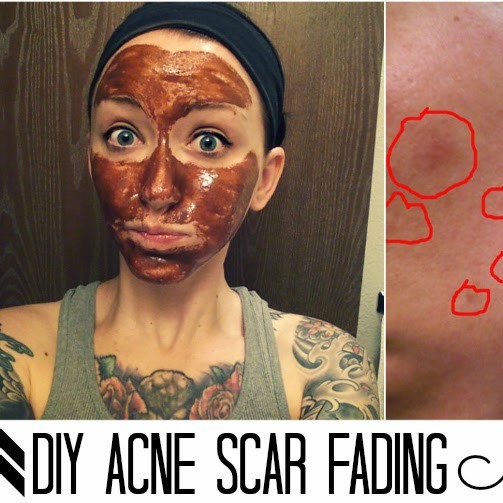 I too have been using ACV as a toner and it has done wonders for my skin. I just had to comment after reading your line about hormonal breakouts. There is a cure! For me at least. Once a month, like clockwork, I would get the worst breakouts on my chin and nose. So after a lot of research I decided to try Cod Liver Oil. Its just a supplement in a pill form - I bought mine in the vitamin section of the grocery store. While it looks like a fish oil capsule it has really high levels of vitamin A and is amazing for your skin- especially hormonal breakouts. Nothing has ever changed my skin like cod liver oil has. I know I sound like a spammer probably but I just had to share! The combination of the supplements and the ACV has left me with the best skin of my life! I agree, Cod liver oil, or even better, Fermented Cod Liver Oil is excellent for balancing hormones. So is Maca. Is it weird to say I love you? I've had the same problem, super oily skin and acne for 11 years! Being 21 and with acne is a huge no-no. 10 years and 11 months is far to long! I will definitely be giving this a try! So thank you in advance! Oh, wow! We have nearly the EXACT same skin! Mine is slightly thicker, therefore less sensitive but it is uncanny! My esthetician said the breakouts and blackheads come from our skin being so thick and not getting enough exfoliation, therefore the oil, dead skin and dirt get caught in there and cause acne, sometimes cystic. The ACV works so well because of all the things you said, but it also has a high acidic level which helps get rid of those top layers that would usually get trapped and turn into infections. Sorry, this comment is so long, I just never find anyone with similar skin! Most people in their twenties say their skin is horrible because they may get a tiny zit every month or so. Anyways, I am using straight ACV and it is working very well. I started doing this a few weeks ago after reading your blog. LOVE IT! I was spending so much money on drugstore products to clear up my acne and this works SO SO much better. Although, right now, I have two huge breakouts on my face due to pms. But I'm hoping they don't too bad. Thanks! how often do you do this? every night? I've been using a mixture of equal parts castor and olive oil as a cleanser (i rub it all over my face and let it sit with a hot washcloth for 30 seconds, then wipe it all off with water) which seems to work well but i'd like to experiment with this too! I had the same experience, couldn't believe how well it worked. I not only had pimples constantly (at 25), but a skin rash that doctors had prescribed steroids for but hadn't worked at all, ACV cleared up my skin significantly in the past two weeks. The rash has improved tremendously, and my skin on my face looks soooo much better! Not only way less pimples, but less whiteheads and blackheads, and overall improved appearance, not oily and dry in random patches like usual. I also started taking a tablespoon with a big glass of water in the morning before eating because its supposed to help with acid reflux and other digestive issues, so far it seems like its helped, but still a bit soon to tell. Stumbled upon your blog. Wow. Your skin without makeup looks fantastic, I wish I was so lucky! I'm 28 and still struggling with breakouts - will definitely give ACV a try now! Do you use a grocery store brand or one of those fancy organic kinds? I just use the generic store brand! It works great & is SUPER cheap, especially when compared to other expensive toners that don't even work on my skin type. Your skin looks great! I've only started using ACV around 2 weeks ago and I love the way it makes your skin feel. I'm currently going through a little purging stage though, my PH levels are near perfect and I can't wait to an 'after pic'. I've also been drinking it and honestly it works wonders. Love that it's natural as well, I hactually know what is going on my skin now! have to try this! I have the same thing and looking for a remedy also, btw I just turned 40 and it seems like my zits or acne is worse! Great. I was using that before but not for so long, I thnk I loved it. I dont know why I stopped. Now am having breakouts and am taking biotin anyways. I would just go back to using ACV for my cleanser. Thanks for posting this, I'll have to try it out on my freckles. I'm 32 and have recently discovered the wonderful benefits of olive oil as a moisturizer. 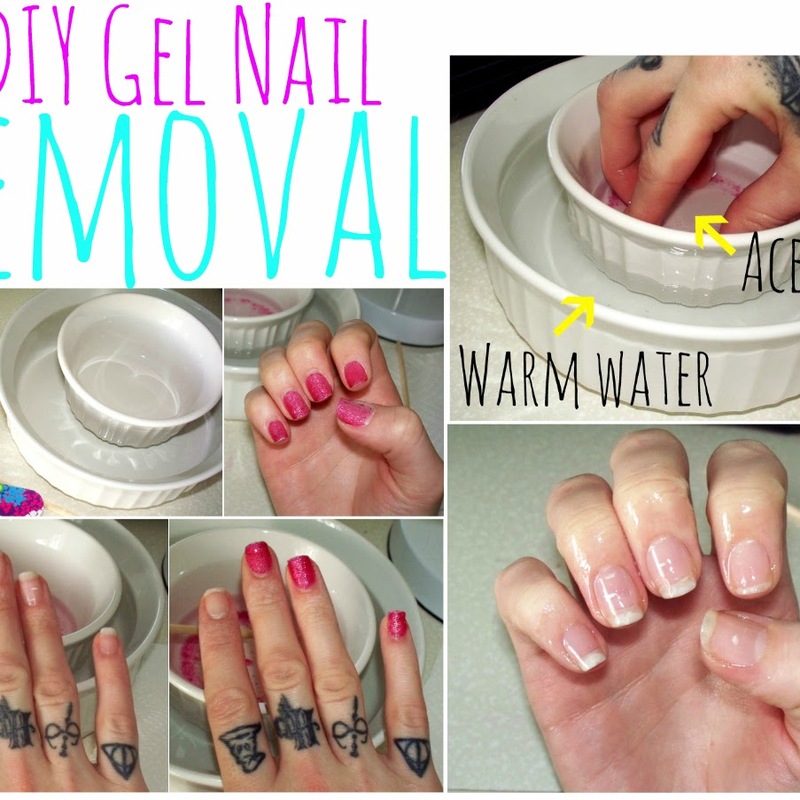 If you're into diy skin care, you might want to try it out, it's also great at reducing breakouts. Great info, I have been using Bragg's organic, it is a bit more expensive..okay, more than a bit. After using cheaper filtered brands I wasn't getting the results I wanted, but the Bragg has actually cleared ALL of my acne and some of the scarring that I have had for years. I just started using a Manuka honey 5+ bioactive a couple of weeks ago as a mask a few times a week and toning with the ACV. It is working wonders! I love it. I don't wear makeup beacause it breaks me out so even more frustrating when I had to walk around with scars and discoloration on my face. Good luck! I started this a couple days ago. Hoping just using once a day...at night will work. Don't want the smell during the day. :-) has anyone had luck using once a day? Alright dude...I'm seriously so fed up with my skin right now...it goes back and forth between eczema flare up to huge painful zits and it looks like freaking crap all the time. I recently got rid of all my non-working lotions/creams/moisturizers and I'm sticking with the Clinique and Burt's Bee's (mostly BB until I can get this under control). I'm going to mix up some of this tomorrow and hope that it helps. I'm pretty much at wit's end and I'd really love to use something natural because the only other option is go to the doc where they'll either give me steroid ointment (yay - let me thin my skin) or oral steroids (so I can be hormonal and hangry for a week) and then it'll just come back when I stop using them. *sigh* What is your best advice for how many times a day to do this? you look much better without the makeup. You're a 10 without makeup but an 8 with. Lovin ur log and great skin too! I stop using acv toner and I regret it.. Started having breakout again because I tried using other products which I thought its good since my pimples were already gone :( bad decision. Now im on my 3rd day using acv toner again and im seeing results. Yay!! Im sticking my face to this one. I swear! Good job hun! 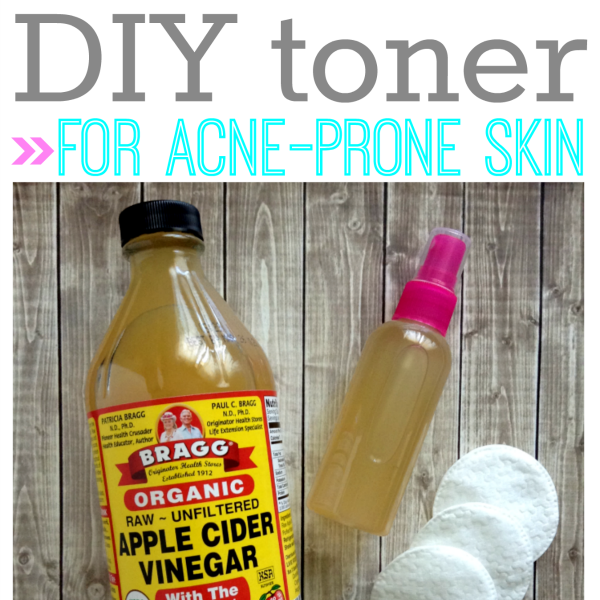 Do you use ACV as a toner twice a day or once a day? David- I hope the ACV works for you! I had tried everything under the sun & this is the only thing that has worked for me. I've been using it for over a year now and it's just part of my morning & nightly routine- I rarely, if ever, get a zit anymore! 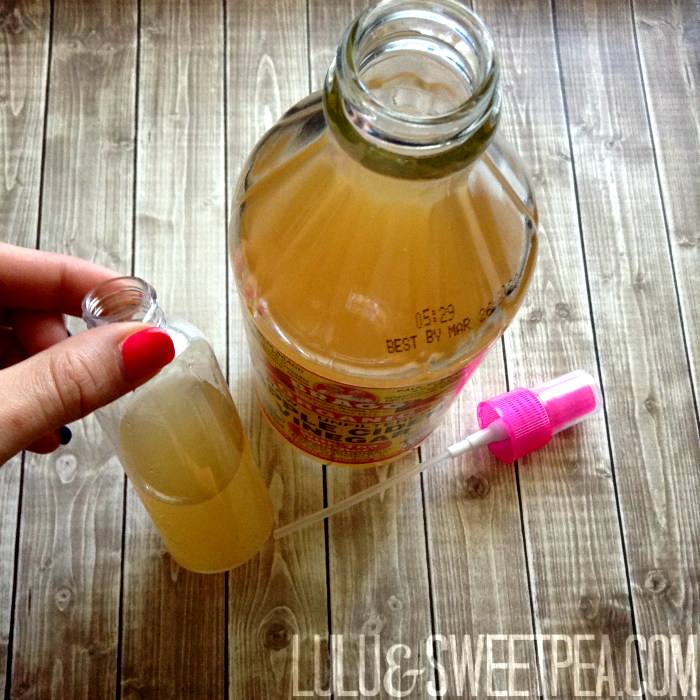 You are making sure to dilute the ACV mixture to begin with, right? I use it morning and night, but depending on your skin you may only want/need to use it once a day. 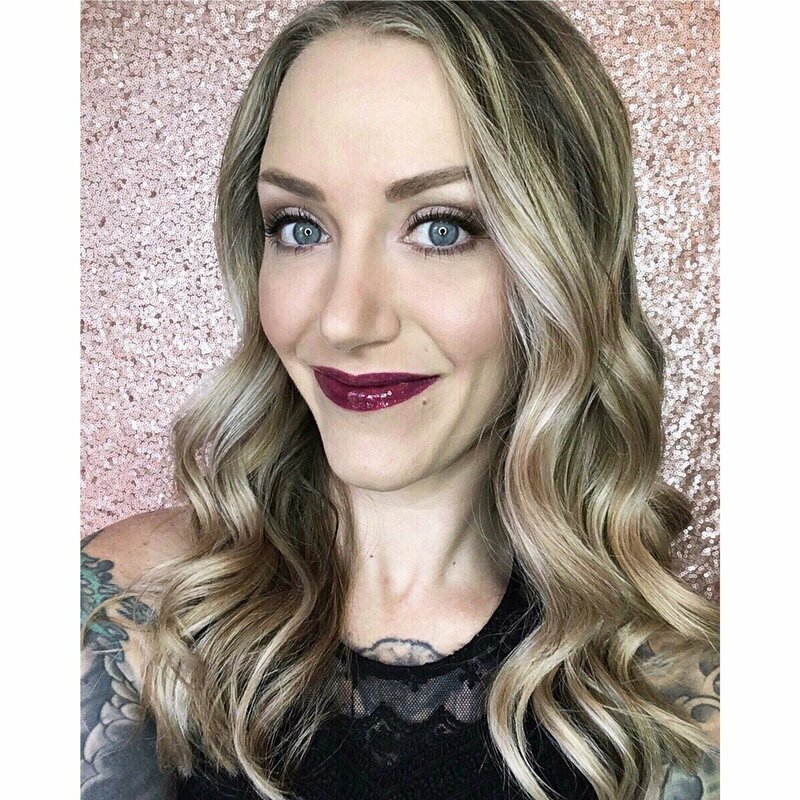 Everyone is going to be a little different- but I've been using it for over a year now undiluted (after working my way up from diluted) and my skin has never been better! 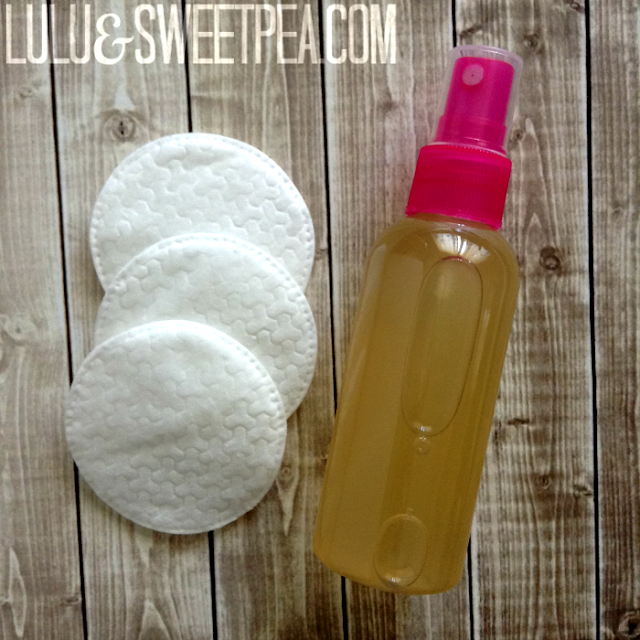 No breakouts, no drying, and it's super soft. ACV has totally transformed my skin. Think distillers white vinegar would work? On another note, the burning face mask... Would the recipe keep of I refrigerated it a few days and use the remainder then? Thanks! Has anyone else noticed this? Its weird and gross, and oddly satisfying, but I've been using a diluted acv toner for a few days, and the blackheads on my nose are, um, squeezable. They have been there forever, and usually, I can try to squeeze them and nothing will happen. They're too deep, but now, the little goo plugs pop right out and the pore sort of vanishes. Its like a layer of yuck has been stripped. Fantastic! I agree! Raw unfiltered ACV also has lots of yummy things for your skin. Purchase some raw, unfiltered, and unpasteurized apple cider vinegar with the “mother” left in. The mother of vinegar is a cellulose substance made up of the bacteria that cause fermentation. It’s what causes the vinegar to look cloudy or murky, but it’s completely harmless, and has many health benefits. The mother of vinegar is the naturally occurring strand-like enzymes that are only found in raw, unfiltered apple cider vinegar. To meet this demand of clear, light-colored vinegar sans the brownish, cobweb "mother" is the reason producers distill their vinegar. In distilling, the vinegar is turned to steam by heating, thus destroying the powerful enzymes and evaporating the life-giving minerals such as potassium, phosphorus, natural organic fluorine, silicon, trace minerals and pectin as well as many other powerful nutrients! Distilling also destroys the natural malic and tartaric acids which are important in fighting body toxins and inhibiting unfriendly bacteria. You look gorgeous and I love ur eyes.